The Working Families Party, whose leaders argued that a politician could win who walked the Left walk and spoke to the vast majority of New Yorkers who do not vacation in the tummy-tuck Hamptons. So, props to Dan Cantor and Bob Masters and a legion of other friends and comrades and the great organizations, including ACORN, the CWA, and 1199 that have been pillars of the Working Families Party of New York since its founding, and have consistently argued that if you develop policies that work for the majority of people and stick to them, then by damn the majority of people will also vote for you, if everything is equal. Left, right, whatever, this is just smart, little “d” democratic politics that unfortunately too many candidates more concerned with special interests and influence peddlers, institutions, and big money are not willing to do, so voters reply with disinterest and the majority will is regularly high jacked more often than it is rejected. Politicians, organizations, and activists across the country need to take both heart and notice of both de Blasio’s campaign and his victory. There are lessons here and an available guidebook, everything being equal. The “everything being equal” thing is a cautionary variable. The Republicans and the radical rightwing understand that there are often good chances for the majority interests to win in elections, which is why their campaign to change the voting rules to suppress the ability of lower income and minority voters to be able to vote is so important. And, money has become such a huge factor in candidate calculations and viability that many candidates hobble their campaigns from the start by bolting themselves at the hip to their donors, rather than the true interests of the vast majority of their constituencies. Bill de Blasio raised a lot of money without a question, but hewed his campaign and his message to what resonated with people even when his coffers were thinner, and of course money flowed to him once he began to emerge as the likely winner, as various interests tried to get a bet down before it was too late for them to have an investment and voice in the next four years. It turns out that your candidacy can be hurt by being tied to delays in approving sick pay for workers and in your ties to billionaires. It turns out you can be helped by supporting working people and community organizations. Who knew? We knew! 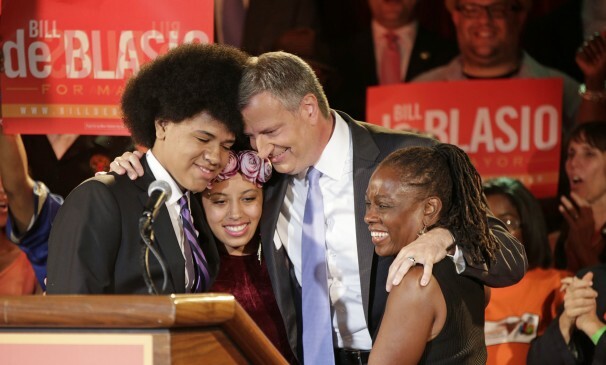 There are many morals in this New York City mayoralty election. We need to sing this message from every roofbeam! This entry was posted in Ideas and Issues and tagged Bill De Blasio, Left, New York, New York Mayor's Race, politics, Working Families Party by Wade. Bookmark the permalink.